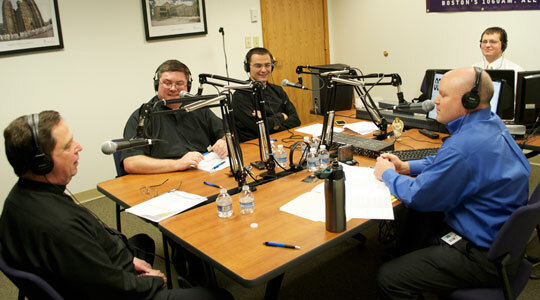 Today’s guests: Bishop Robery Hennessey, auxiliary bishop for the Archdiocese of Boston, and Sinisa Ubiparipovic, a seminarian studying at St. John’s Seminary. A summary of today’s show: Bishop Robert Hennessey reflects on the beauty of the Sacrament of Confession and the message of God’s forgiveness it contains. He also notes the wonderful success of The Light Is On For You, a confession initiative during Lent and Advent. Seminarian Sinisa Ubiparipovic talked of his journey to seminary and his recent travels to South America with the St. James Society, while Bishop Hennessey recalled his years with the Society, the important work they do, and the important fruit it continues to bear for the Archdiocese. 1st segment: Fr. Chris O’Connor joined Scot on the show for the first time. He shared some of his background that brought him to the seminary. He grew up in Dorchester and Quincy, went to BC High, attended St. John’s Seminary College, went to Rome for a year, returned to finish his studies, spent some time in St. Mary, Chelmsford, received a doctorate in Philosophy from Catholic U in DC. St. John’s has had a renewal in recent years. It has almost reached capacity with seminarians and continues to grow. Many of the men entering were inspired by the example of Pope John Paul II. Bishop Arthur Kennedy, the rector, has provided great leadership and expanded their mission to become a regional seminary. It also offers a series of lay leadership and ministry formation courses. There is a master of arts in ministry program to form parish ministers. They also offer catechetical certificates. On Thursday at 11am, Cardinal Seán and Bishop Kennedy will announce a new lay formation program during a press conference at the cathedral, followed by the St. Patrick’s Day Mass. 2nd segment: Bishop Robert Hennessey joined the program. He was ordained a bishop on December 12, 2006. Prior to that, he served the Church in various ways, including the St. James Society. He grew up in South Boston at St. Augustine’s parish. He attended St. John Seminary and then served in several parishes and then went to Bolivia for several years with the St. James Society. He then served Most Holy Redeemer in East Boston, the largest Spanish-speaking parish in the archdiocese, as pastor for 12 years. Then he was appointed as bishop. Two years ago he was appointed to lead The Light Is On For You, a Confession initiative for Lent and Advent. Confession is not just for Lent, Bishop Hennessey said, but frequent confession is good for us. It is a great place to find out, not that we’re bad, but that we’re loved by God. Even if we disappoint God or anger Him through our sins, we are still beloved of Him. Fr. Chris asked the bishop which Scripture passage he would say is the best to talk about Confession. The bishop loves the Prodigal Son, mainly because the young man was able to admit his faults, but also before he could tell his father that he was no longer worthy to be his son, the father cut him off with his loving forgiveness. We cannot say we are not worthy to be loved by the Father, because His love is a free gift of His grace and His very nature. Scot said that it is not just the story of the Prodigal Son, but also the story of the Loving Father. Bishop Hennessey said that the father was keeping watch for his son, because we know he saw the son coming back from a distance. In Pope Benedict’s book, “Jesus of Nazareth”, he says it’s not just the Prodigal Son, but the Prodigal Sons, because it is both sons who disappoint their father and who need forgiveness. Bishop Hennessey said that the adage is true: Confession is good for the soul. He is always amazed in hearing confessions that people are willing to share with him those intense moments of their lives and feels great being an instrument of that forgiveness of God. Scot observed that the Sacrament of Penance is not used as frequently as it used to be, citing a recent study: 14% of Catholics go several times a year or more, 12% once per year, 30% less than once per year and 45% can’t remember their last confession. Bishop Hennessey said he thinks people just got out of the habit. In his childhood, he remembers that everyone went to confession on Saturdays. That was the only thing going on in the Church on Saturdays. But now, the vigil Mass puts a limit on how long the priest can be in the confessional. A part of the reason is we’re not providing as many opportunities for confession. This is why they chose Wednesday for The Light Is On For You because Saturday from 3-4pm is so busy in our modern lives. Scot recalls a powerful analogy by the author and speaker Matthew Kelly in his book “Rediscovering Catholicism” comparing confession to getting your car washed and detailed. Kelly’s analogy is that after a car wash and detailing, you avoid every mud puddle and try to keep the interior spotless, but over time, the dirt inevitably comes and trash accumulates and you stop trying as hard to keep it clean. Likewise after confession, we are careful to avoid sin, but then we begin to allow venial sin into our life and as those venial sins pile up, we become desensitized even to mortal sin. So frequent confession keeps us sensitized to sin. Bishop Hennessey likes the analogy because the spiritual cleansing of confession is for our interior life, like the detailing of the car. Fr. Chris noted that Cardinal O’Connor had said that no sin can be more powerful than the power of the Cross. 3rd segment: Discussing now The Light Is On For You. It began in some other dioceses, and Cardinal Seán brought it up in a meeting of Boston’s bishops several years ago, asking Bishop Hennessey to lead it. TLIOFY started in Lent 2010 and it has been received well by priests and parishioners. He had assured them that this was not something that would require meetings. They just had to be in their churches on Wednesdays. A key is that it is every parish at the same time so that the people know they can go anywhere, wherever they are, Wednesdays 6:30-8pm. The best estimates (because the seal of confession forbids taking counts) is that more than 30,000 people went during the Wednesdays in Lent last year. Fr. Chris said that having a regular scheduled time of confession is helpful because of our very busy scheduled lives. Bishop Hennessey said some worried whether priests would support this, because it would not work without their support, but his experience is of almost universal support. He got two complaints from priests last year, and one of them called him back after Easter to apologize because of how wonderful it was. The other turned out not the be angry at all, but reported that he was in the confessional until after 10pm hearing confessions. Scot noted that there was a concern that we were asking priests to add yet another duty to their already stretched lives. They were also concerned whether anyone would show. Fr. Chris said he was meeting a priest for dinner at a Wednesday last year, but while the priest was waiting outside the chapel for Fr. Chris to finish, he started to hear even more confessions from so many people who were waiting. Scot said some people call it the forgotten sacrament, which may indicate that as a Church we don’t embrace it as frequently as we should. Bishop Hennessey said that in his 12 years as a pastor, he learned firsthand the difficult schedules that pastors have, but also that administering the sacrament of confession was a beautiful part of his vocation appreciated by all priests. For people who think their sins are just too big or too complex for some young priest to hear them, Bishop Hennessey said it’s not about the priest’s experience, but it’s about receiving God’s mercy and encountering His infinite loving forgiveness, which is medicine for the soul. Scot said we wouldn’t be reluctant to tell our doctor what our symptoms are if we really want to be healed of whatever ails us. Plus, a priest of almost any experience will have heard just about everything. Bishop Hennessey said it was a joy to hear people bare their souls so he could offer them the words of forgiveness they were seeking and the penitent often thanked him for lifting their burden. Fr. Chris noted that the sacraments offers both forgiveness and grace and the grace gives assistance to avoid that sin again in life. If someone has not been to confession in a long time and feels unsure of what to do or say, that’s okay because the priest is there to help them and wants to help them. Scot said that in the story of the Prodigal Son the father throws a celebration for his son who has returned, and God rejoices whenever we return to Him in the sacrament of confession. The website of The Light Is On For You has tremendous resources for examination of conscience and to learn more about the sacrament of confession and God’s loving forgiveness. All the prayers are there, print them out from the website and bring them with you to the confessional. 4th segment: Sinisa Ubiparipovic was born in Yugoslavia, in Bosnia in 1987, his family moved to Germany temporarily, and in 1999 came to the United States. They lived in Lynn, which was a culture shock because he grew up in a small village. He worked at St. Joseph’s church as a youth and the pastor there encouraged him to become a priest, but he refused to consider it. He studied accounting at Bentley College, lived a typical college lifestyle, and traveled throughout Europe encountering all kinds of people. But no matter who he talked to, he noticed that everyone was looking for happiness, which led him to wonder where that desire comes from. He concluded that there must be an answer to the desire for true and eternal happiness. When he went to see Pope Benedict in New York City, he saw all around him the incredible diversity of the Church, like the incredibly rich diversity of peoples he had encountered in his travels. That’s when he applied to the seminary. As part of his studies last year for spring break, he went with a group from St. John’s to Peru to work with the St. James Society. Sinisa had never been to South America. The first day they arrived, they were sent to parishes and he ended up at the parish furthest from the mother house for the society. This parish had 40,000-50,000 parishioners and all were extremely poor in a dirty, dusty shantytown. Nevertheless, the people had a sense of faith and a sense of hope for life beyond this life. Fr. Chris said the experience made him aware of how blessed we are as Americans, even to have clean water from a tap. The sheer poverty you encounter, yet also people filled with life and joy. People had very little, but were extremely happy because they had the Lord. It made him aware of where our focus should truly be. Bishop Hennessey was pastor of a parish in Bolivia for many years as a member of the St. James Society. He recalled that when the people prayed, “Give us this day our daily bread,” they meant it in a literal way. The people wanted more out of life, but there was also a contentment in daily life. He was led to the missions because as a young priest he was blessed with a great pastor in Plymouth, Fr. Dan Lynch, who had served in the society. Fr. Lynch spoke about the fraternity among the St. James priests, who become closer in their bond of priesthood because they are serving in an alien culture with a different language, even though they may be physically distant from one another. When Bishop Hennessey was in Bolivia, the nearest priest was sometimes stationed several hours away. The St. James Society was founded by Cardinal Richard Cushing in the 1960s responding to a call by the Pope for dioceses to be generous with their priests to the missions. And now as we struggle to have enough priests for our people, we are receiving many priests from the places to which we had sent our priests in those years past. Fr. Chris asked Bishop Hennessey what sort of Lenten practices he saw in South America that we could adopt here. He saw an emphasis on confessions. There are also penitential groups that get together regularly for corporal works of mercy, but also literally to carry the image of Our Crucified Lord through the streets of the city for hours at a time. Bishop Hennessey said the Archdiocese of Boston is stronger for all the immigrants that have come to us in recent years and we are reaping the rewards as a Church. Fasting and almsgiving are disciplines for Lent that help us to remember the needs of others. What should we be doing to support the missions through our Lenten disciplines? The Lenten almsgiving boxes (“rice bowls”) are still quite effective. Even little bits of money, gathered together, go a long way. As a young man studying for the priesthood, Sinisa takes to heart the admonition that every priest is called to be a missionary, whether at home or abroad. He hopes that as a priest he can be a bridge to salvation through the sacrament of confession, even if he can be that conduit just once for one dying penitent soul. Cardinal Seán is asking every Catholic to be a missionary by praying for and inviting home Catholics who are away from the Church. Bishop Hennessey sees that The Light Is On For You as the best way for Catholics to come home, by getting a complete fresh start.